Epiphany is usually the first choice for GNOME users who want to use a web browser which is lighter than Firefox and integrates well with GNOME. Of course, there are alternatives like Konqueror or Opera out there, but they are either too bloated compared to Epiphany, or they don't integrate very well with the GNOME desktop environment. 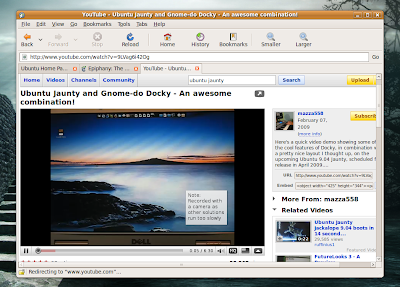 Being the default web browser in GNOME and built using the GTK toolkit, Epiphany became over time a well-known web browser especially for the fact that it is lightweight and has a basic, clean interface. 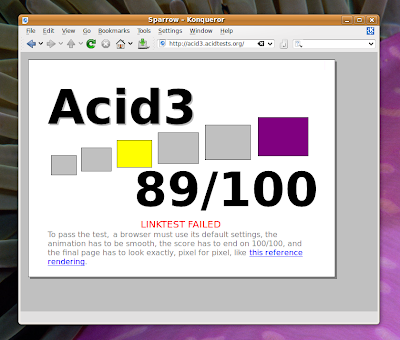 The rendering engine used by this browser is the same as Firefox, Gecko and has a score of 72/100 at the Acid3 Test. By comparison, Firefox 3.5 got 93/100, Opera 10 Beta got an impressive (and expected) 100/100 and Konqueror 4.2.95 (included in KDE 4.3 RC1) got 89/100. 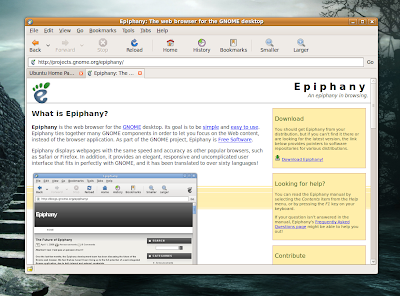 Epiphany comes with a common interface for a web browser and has all the main features included: extensions, bookmarks, possibility to increase or decrease font size, tabs, fast access to back, forward, stop, reload, home, history and bookmarks functions in the toolbar, support for text encoding, it allows to open the page source by default in Gedit, a fullscreen mode (accessible from the menu or using the F11 keyboard shortcut) and a personal data window which stores and shows cookies and passwords. Epiphany also has a bookmark manager and it allows to import Firefox or Galeon (an older web browser, currently unmaintained as far as I know) bookmarks. The preferences window offers the possibility to change the basic settings, like font sizes and the fonts to use for displaying web pages, settings for privacy, temporary files, language encodings and how files are downloaded. These are just a few, Epiphany comes with even more, which you can view and enable or disable from Tools -> Extensions. Documentation is available online and offline via the Help -> Contents menu entry (or using F11). Using Gecko, Epiphany will successfully display all the pages Firefox 3.0 displays (or it should, theoretically). I had no problems viewing YouTube videos (provided that Flash plugin was installed on the system) or writing a Blogger post. 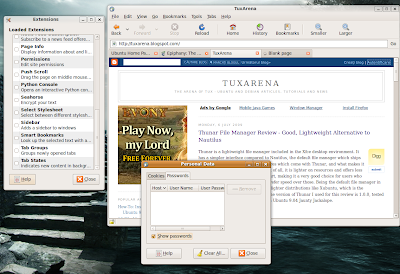 In conclusion, if you're looking a GTK alternative to Firefox, then Epiphany is the way to go. Lightweight but very powerful due to the use of included extensions, with mostly all the necessary features built-in, Epiphany can prove a viable alternative to more bloated solutions. Ubuntu users, notice that you'll have to type sudo apt-get install epiphany-browser to get it installed, since the epiphany package is a game. Ohhh my god, stop calling browsers which have more features than this one bloated, it's pure ignorance. And define the word bloeated, cause currently it is simple defence against other projects that have a lot more features that users need. "I think that Firefox has too many features that I don't find useful." See you should express your personal feelings this way. Don't pretend that what you think or feel is a general truth. I'm totally agree with AIM. People can't state more than their opinion anyway, putting "I think" in front of every sentence is a chore. If someone finds they need Firefox for the features, they'll continue using it. Agree w/AIM. The review would have been fine apart from the "bloated" pejorative. But it's lacking performance benchmarks, apples-apples feature comparisons, etc. Not a comprehensive review and I'm not sure it was intended to be ... although nowadays readers expect thorough comparisons. It's fine if the GNOME aesthetic is to eschew features in favor of minimalism and simplicity, but any review of GNOME native equivalents of anything should preface with that. Personally, GNOME is not for me, and it is just not as useful as KDE and Mac environments, but I can appreciate having a design aesthetic and sticking to it, and saying something like "Epiphany fits our design goal" instead of saying a trashy comment about Firefox and Konqueror such as "bloated". I hope web punditry will evolve someday. I dissagree with the previous comments. Try running Firefox and Epiphany at the same time, then try surfing the same pages. When I did it I found that Firefox used 150-200 MB while Epiphany needed only 70-100 MB. I agree that memory is not too expensive, but still some people need to use older computers. For them Firefox is bloated. "I dissagree with the previous comments." So you say, that software bloat is not a subjective attribute? You say that if you personally consider an application bloated, that that's a general truth? "Try running Firefox and Epiphany at the same time, then try surfing the same pages. 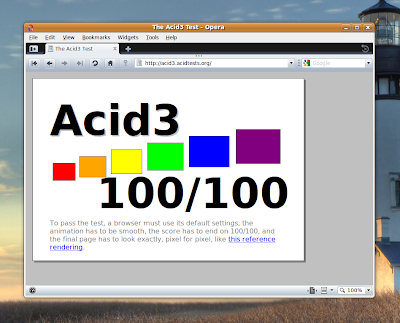 When I did it I found that Firefox used 150-200 MB while Epiphany needed only 70-100 MB." This means nothing, I can make up similar stories, but it won't prove nothing. "I agree that memory is not too expensive, but still some people need to use older computers. For them Firefox is bloated." "Epiphany is bloated because it uses more memory than lynx, and some people use mobile phones where Epiphany is bloated." I think you didn't understand what I was saying, read it with more attention next time. Not to continue the "bloated" argument, but I tried Epiphany on an old Thinkpad and I always get runaway memory usage. I would like to use it since it is lighter than FF, but this laptop has a slow CPU as well as only 256MB RAM. Anyone else seen this problem? AIM, you "can make up similar stories", but the readers can repeat my measurement and see for themselves that my numbers are right. Your rethorics can not change the facts. About the use of the word "bloated": I am willing to consider that it is not the right word here. If you think that we should reserve it for the rare software that does nothing at all, so be it. But this does not change the fact that epiphany is a valid alternative for some people that use older computers and can not afford to have one program taking more than half their memory. Fred, what version of epiphany did you try? I'm using 2.27 - a newer version that is based on webkit. 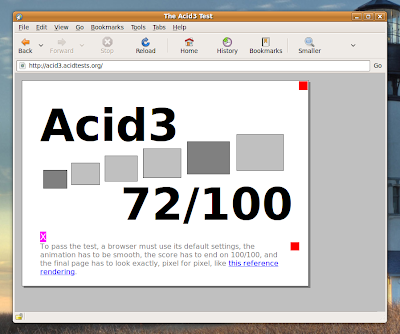 It seems to be lighter and more stable than the gecko versions, and btw it scores 100 in the acid3 test. The problem is that the extentions were not adaped to webkit yet. "AIM, you "can make up similar stories", but the readers can repeat my measurement and see for themselves that my numbers are right. Your rethorics can not change the facts." There are differences between facts and opinions, you can test browsers with 100 websites, and you say "X browser won this particular test", that is a fact, but assumptions like the following are not facts: "Because X browser won these tests, X browser is faster than Y browser". To give you a good example, when I used Opera I had at least 10 open tabs, when I switched to Firefox, I could not do that cause Firefox became really unstable when I repeated the same thing there. Does this prove that Opera is faster than Firefox? No it doesn't cause this was one particular situation, when I opened youtube the tables have turned. That is why you can't make assumptions from a few particular tests. "does not change the fact that epiphany is a valid alternative for some people that use older computers and can not afford to have one program taking more than half their memory"
I did not say that Epiphnay is not a valid alternative, sure it is, but you have to admit that you can't say that it's definitely faster than any other browser, if it's faster for what you do, and you don't find it to lack essential features, than go ahead and use it, but you can't say that everybody should use it on low end machines. AIM, I have never said that epiphany is faster than firefox or any other browser. I also said nothing like "everybody should use it on low end machines." 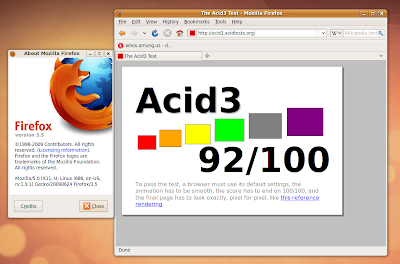 "...a web browser which is lighter than Firefox and integrates well with GNOME." "...but they (alternatives to Firefox, namely Konqueror or Opera) are either too bloated compared to Epiphany, or they don't integrate very well with the GNOME desktop environment." Epiphany is obviously lighter than Firefox. We are not talking about features or zillions of add-ons here. We are focusing on "lightness" on memory load. A light browser has a particular purpose. So, for the time being, this article didn't care at all about the features. It's all about the simplicity and minimalism of a web browser - and that is Epiphany's goal. If someone here is pretending that what he thinks is the general truth, I think it is not Craciun Dan. Relax fanboys. Yeah right... lighter with the same rendering engine...that's a good one. Copyright (C) Craciun Dan 2008-2014. Ethereal theme. Powered by Blogger.